The roles have been casted, the press has been informed: Borgen is coming to the Dutch theatres! The NNT will perform the first ever theatrical adaption of the popular Danish series. With Borgen, written by Adam Price, we can finally take our binge watching to the theatres, since it will be shown as a 10-hour marathon! In Borgen Birgitte Nyborg (Malou Gorter) has to find the balance between her political career and her family. When she gets elected prime minister, both sides of her life start pulling on her like never before. The whole country is clocking every move of the first female prime minister. Eager reporters and sceptic colleagues want to see failing, drama, news, while daughter Laura (Julia Akkermans) is struggling with health issues, that go unnoticed for too long. Is it possible to combine both her career and her family? Or will one of them bite the dust? With a 10-hour production and 2 seasons worth of content, comes a large group of actors. With Malou and Julia, Anna Drijver, Peter Vandemeulebroecke, Harry Piekema, Stefan Dijkman, Bram Coopmans, Dragen Bakema, Bram van der Heijden, Marijke Pinoy, Jochem Stavenuiter, Wim van der Grijn, Eef van der Breen, Eva Tebbe and Mohammed Azaay are portraying the main characters in this thrilling series. Since creater Adam Price is also a professional Danish chef, he is putting together a culinary dinner, exclusively for the NNT adaption. The audience is basically living in the theater that day, so food and drinks are all included and integrated as part of the show. An amazing and unique concept for the theatre world: Let yourself immerse for a day into the political world that is Borgen. It’s time to binge watch! 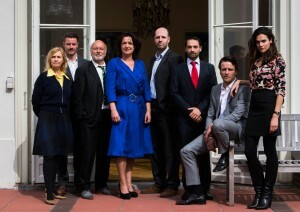 Borgen premiers on March 12, 2016. Tickets can be ordered here.